Ecstasy, also known as E, X, M, XTC, clarity, essence, Adam, beans, rolls, decadence, and M & M -- is a popular street drug. Made from a chemical compound called Methylenedioxymethamphetamine (MDMA), it is considered to be a psychedelic amphetamine. Ecstasy is most commonly found as tablets which are ingested, but it may also be seen as a powder which is in ingested and may be snorted or smoked (rare); very rarely it may be injected (NIDA). Ecstasy is not known to be physically addictive, though withdrawal can cause issues such as fatigue, depression, and loss of appetite. However, it does have the potential to be psychologically addictive, and there is also the potential for tolerance to build. 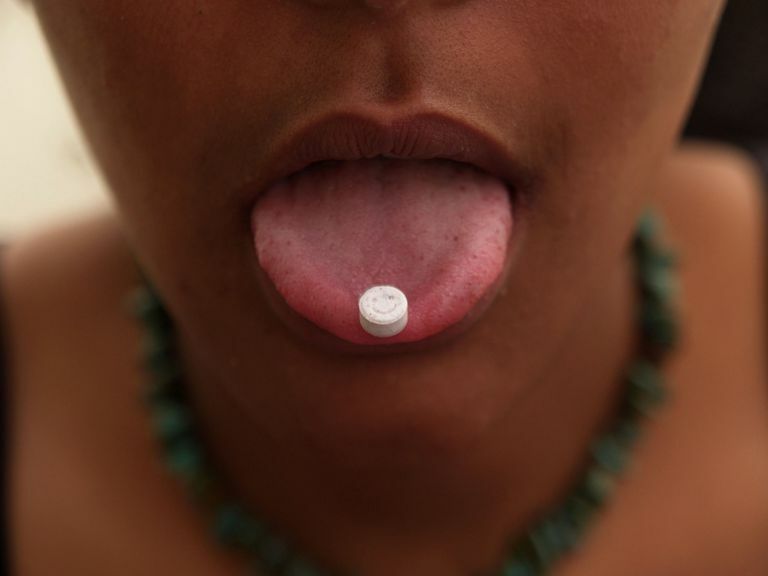 MDMA is a "synthetic psychoactive drug" that combines both "mildly hallucinogenic and amphetamine-like effects" (ONDCP). The more common physical effects of MDMA include an increase in energy, heightened awareness of the senses, visual distortions, appetite loss, nystagmus (rapid, involuntary eye jiggling), restlessness, change in body temperature regulation, jaw clenching and teeth grinding (Erowid). While the overall experience can vary widely from person to person, psychologically MDMA is a drug that increases empathy. These effects include an extreme mood lift, increased communication, a sense of closeness and belonging as well as a strong desire to be hugged and touched by people. Ecstasy is associated with memory loss, confusion, and other issues which can continue long after a dose of the drug has worn off. It also causes problems with temperature regulation in the body, which can lead to hypothermia and organ failure. Ecstasy, like all street drugs, is prepared and sold by non-licensed individuals who may add any number of substances. Caffeine, ephedrine, and other stimulants are often added, which increase risks associated with a rapid pulse and related issues. Along with these concerns is the reality that Ecstasy is often mixed with other recreational drugs. Because most people with bipolar diagnoses are already on at least one medication, and (by definition) have mood-related challenges, taking ecstasy can be particularly risky. Often, bipolar individuals using Ecstasy are attempting to "self-medicate," meaning that they are choosing to use illicit drugs in order to minimize bipolar symptoms. Obviously, this is not an ideal approach to managing any illness. Drug Interactions: Never mix Ecstasy with Monoamine Oxidase Inhibitors (MAOI). The MAOIs, such as Parnate and Nardil among many others, are prescribed for depression. Deaths have occurred due to interactions between Ecstasy and the MAO Inhibitors. Complications With Bipolar Disorder: Some users, most especially those who frequently take Ecstasy or take high doses, experience depression when coming back down. Those already struggling with depression (unipolar or bipolar) may find that Ecstasy exacerbates the condition. Erowid. (2000, August 21). MDMA Basics. National Institute on Drug Abuse (NIDA). (1999, November). NIDA InfoFacts: MDMA (Ecstasy). Office of National Drug Control Policy (ONDCP). Information About "Club" Drug Use.